Thionyl Chloride ER34615M "D" size 3.6V. High Power Spiral Wound. Price: £17.20 each. £15.00 each if you buy two or more. Postage and packing included. Can replace batteries such as: Tadiran TL2300, Tadiran TL4930, Tadiran TL5930, Saft LS-33600, Saft LS-33600C, Saft LSH20, Sonnenschein SL-780, Tekcell SB-D01, Omnicel ER34615, Xeno XL-200F, XL-205F, Minamoto ER34615M, ER20, ER32L615M. This size D ER34615M Lithium Thionyl Chloride battery is an ideal long lasting power source for gas meters and water meters. 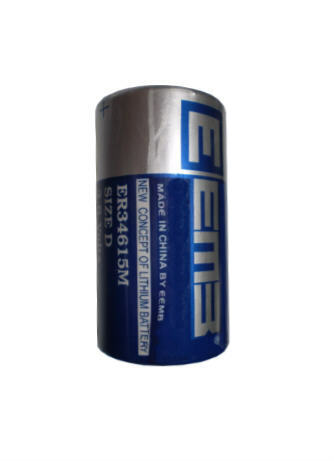 High Power type ER34615M Lithium Thionyl Chloride battery has a spiral structure and a laser sealed can. Suited for high current drain, both continuous and pulse. Although lower than bobbin type high energy type such as the ER34615, these Lithium Thionyl Chloride cells still have one of the highest energy density of any practical Lithium battery chemistry. It also has the widest operating temperature range of -55°C to + 85°C. Self discharge is low at less than 1% per annum at 20°C, giving an effective shelf life of 10 years. Spiral wound cells such as this ER34615M Lithium Thionyl Chloride battery offer superior restart performance for pulsed or intermittent applications. These cells operate with the minimal voltage delay and other effects of passivation. Contact us if you need the tagged version of this cell with solder tags. Visit here if you need the ER34615 bobbin/energy type version of this cell.